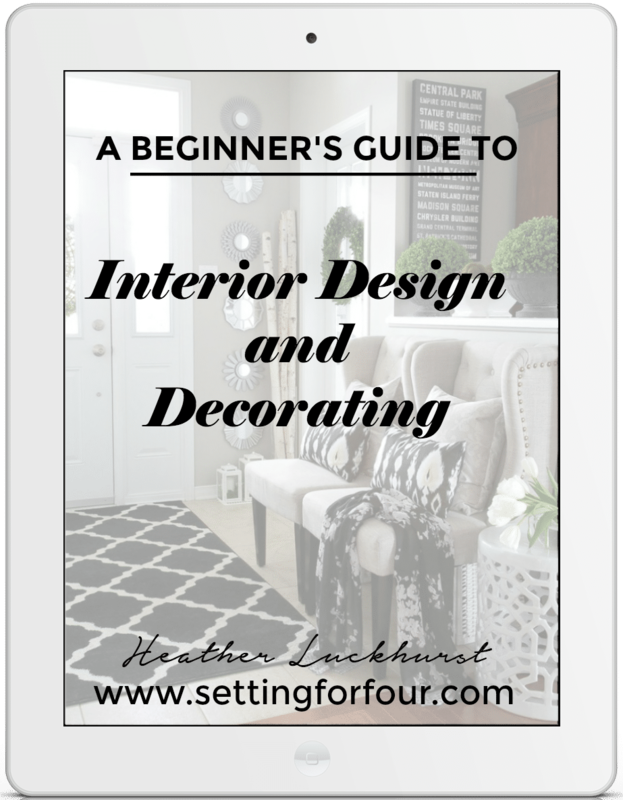 The birds aren’t singing their songs of Spring yet and there is still lots of snow outside – but this week I’m declaring it Spring inside my home and decorating with fresh springy color! 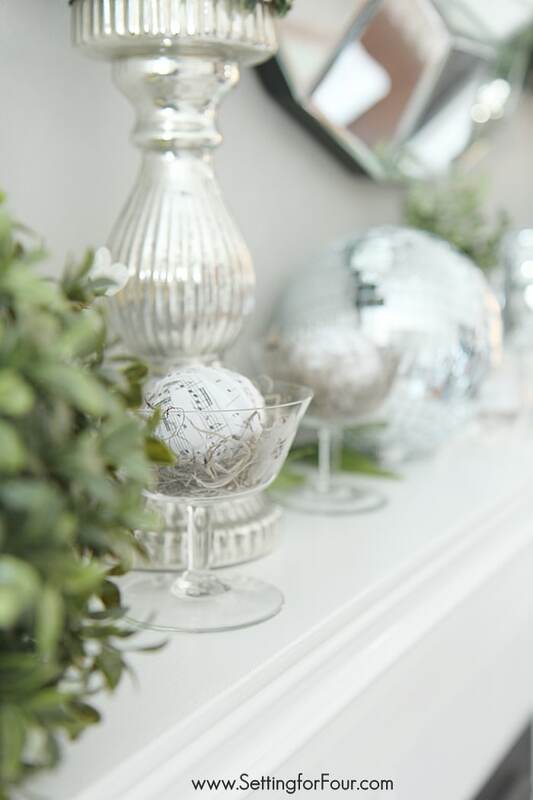 I always start decorating for the seasons in one place every year….my mantel! 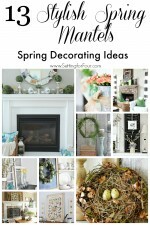 Come see my Spring mantel decorating ideas – I hope you find some inspiration here! 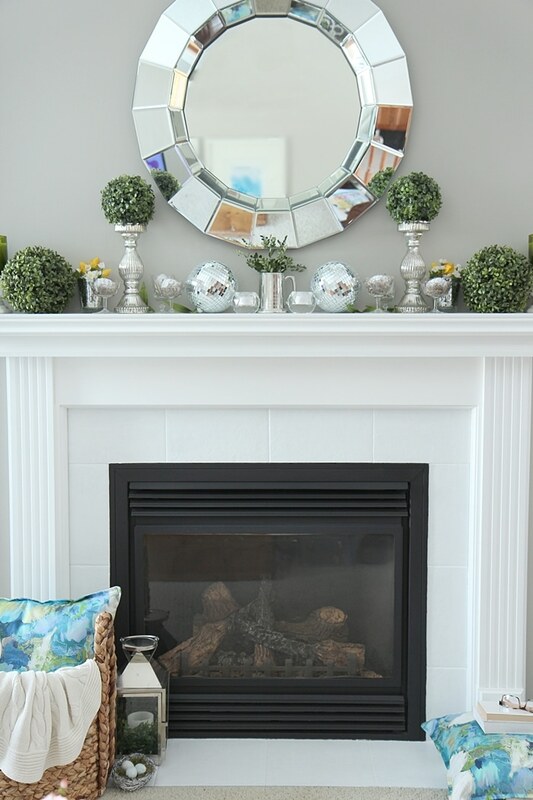 This year I decorated my mantel with lots of green boxwood, silver and white accents, two beautiful blue and green watercolor floral print pillows, a tiny pop of yellow from some tulips….and two disco balls for fun and shimmer! I bought a bunch of these vintage crystal wine glasses (or are they compotes? Sorbet glasses? I’m not sure!) 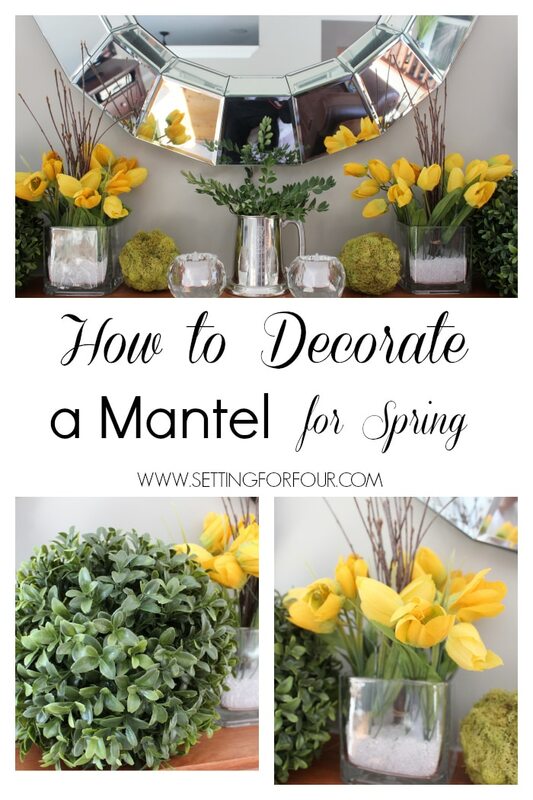 at a thrift shop….they are so pretty with etched flowers on them, perfect for my Spring mantel! 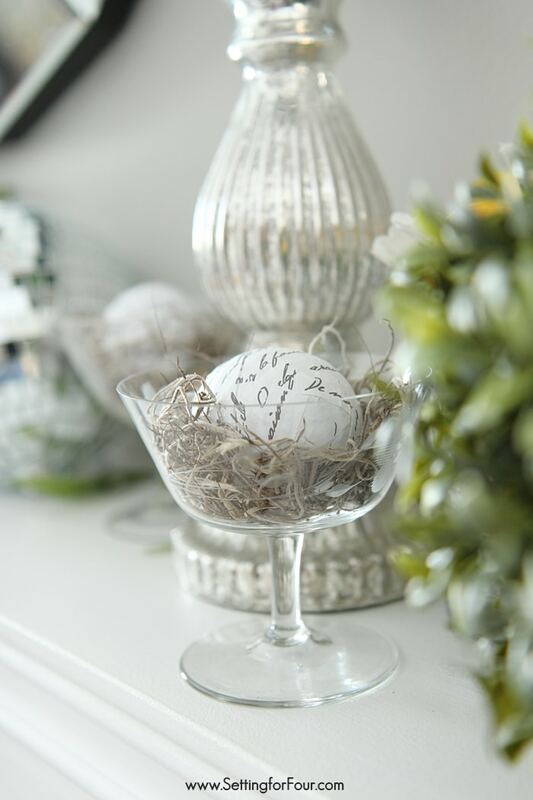 I added a bit of moss and one of my DIY Music Sheet Mod Podge Eggs to create little crystal ‘nests’! I used my mercury glass candlesticks as perches for some boxwood spheres. I love adding decor items with different heights for interest. 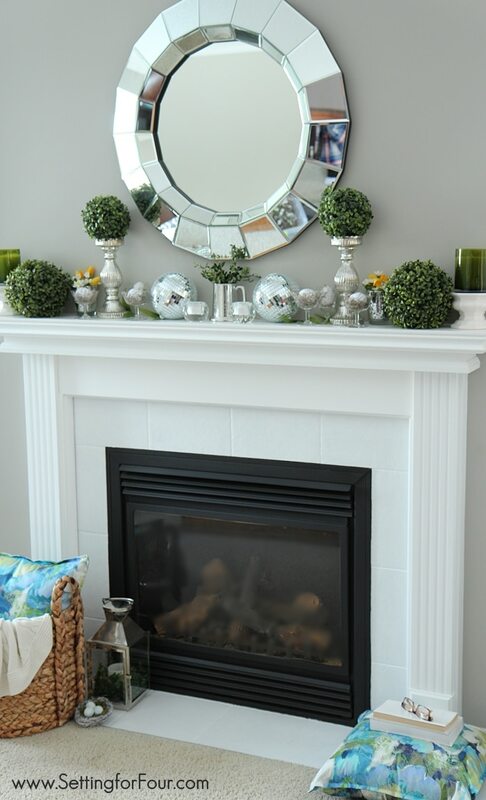 Decorating my fireplace mantel just doesn’t stop at the mantel! I also love to bring in some decor to the bottom too! 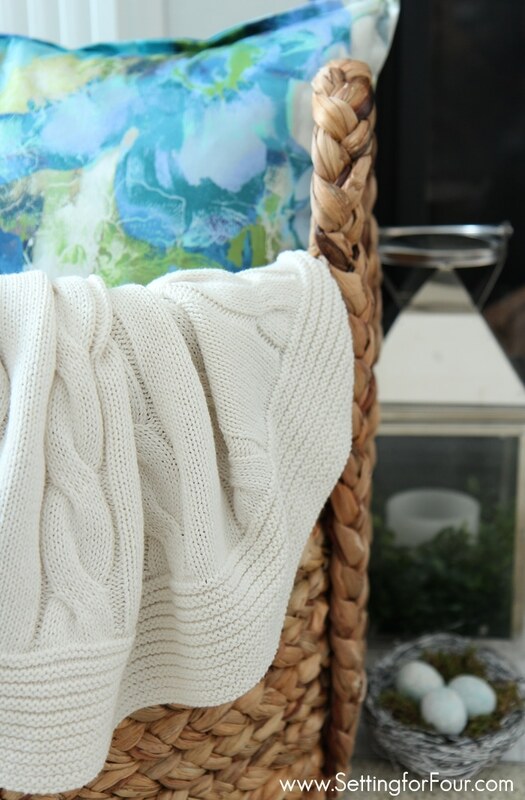 A creamy throw for cool Spring nights is standing by in this woven reed basket. I’m smitten with these watercolor floral pillows covered in a wash of pretty Spring color! I can’t wait for Spring to arrive outside! 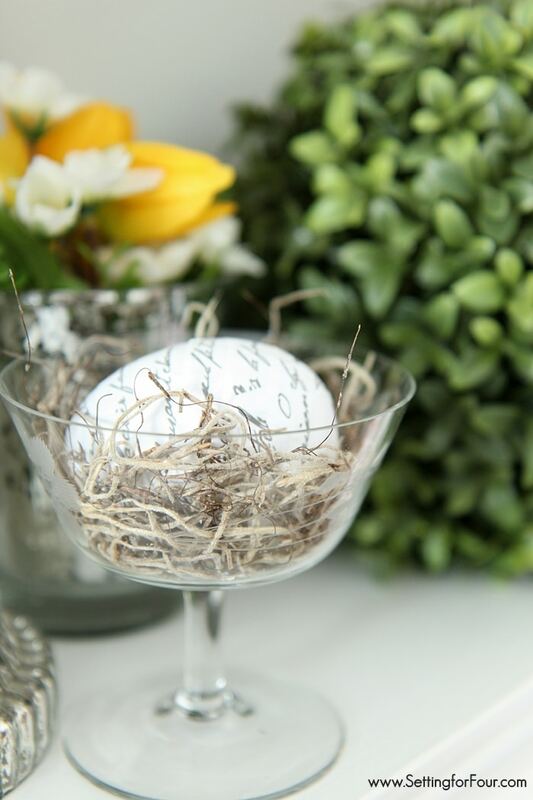 Until then I’ll be keeping busy decorating my home inside – stay tuned for my Spring home tour coming up March 24th! 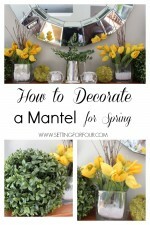 I hope you enjoyed taking a peek at my Spring Mantel today! But wait! 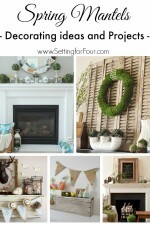 There’s more Spring mantel eye candy to check out!! 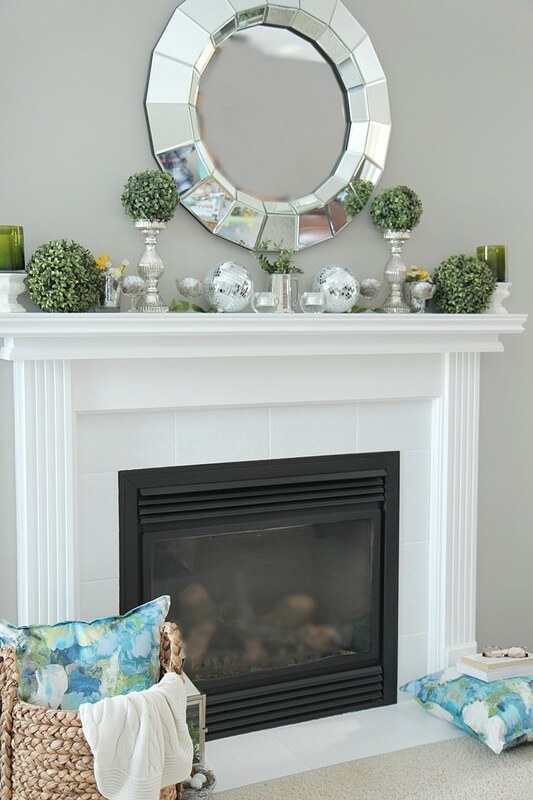 14 beautiful Spring mantels with 14 talented ladies! 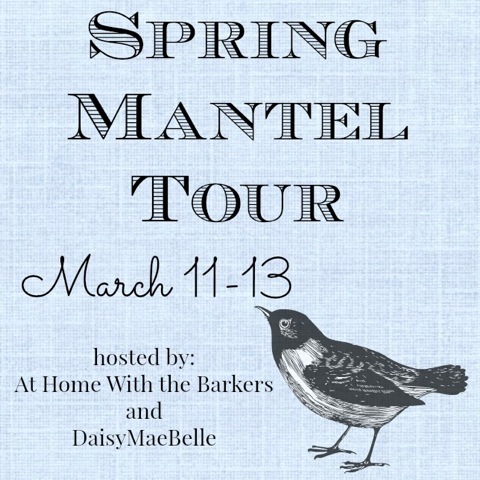 Hop on over to visit these other ladies who are revealing their Spring decorated mantels today! You won’t want to miss it! …and don’t forget to enter these 3 amazing giveaways I have on now! 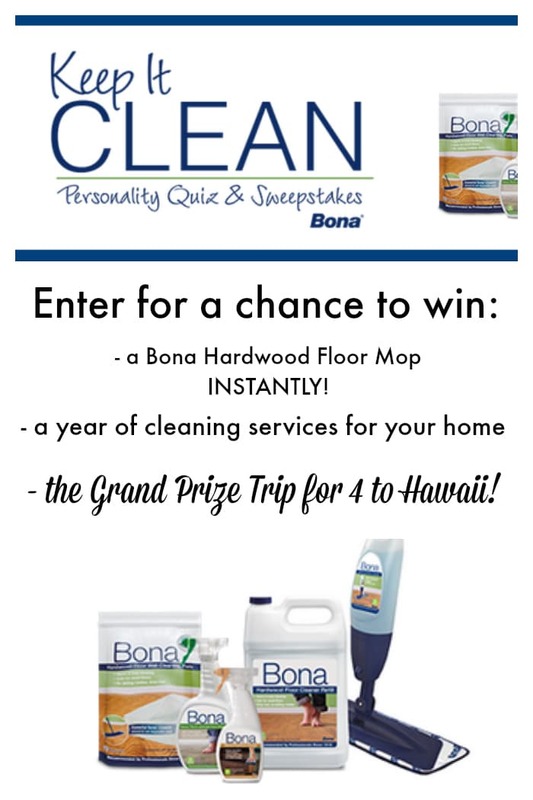 Win a trip for 4 to HAWAII or 1 Year’s WORTH of Housecleaning from Bona! 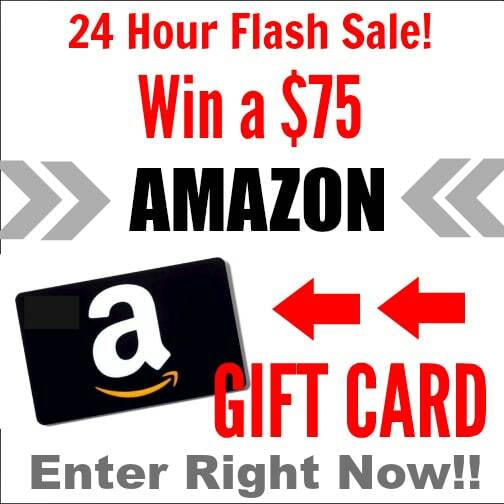 Facebook Round Robin Flash Giveaway – win a $75 Amazon Gift Card and lots more prizes! 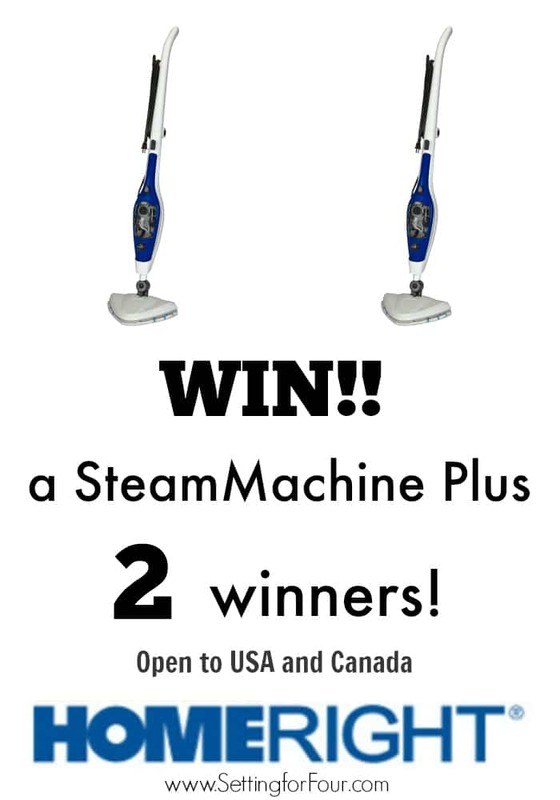 Win a HomeRight SteamMachine Plus! 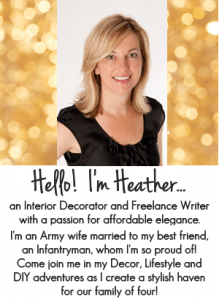 I’m giving 2 away – 2 winners! 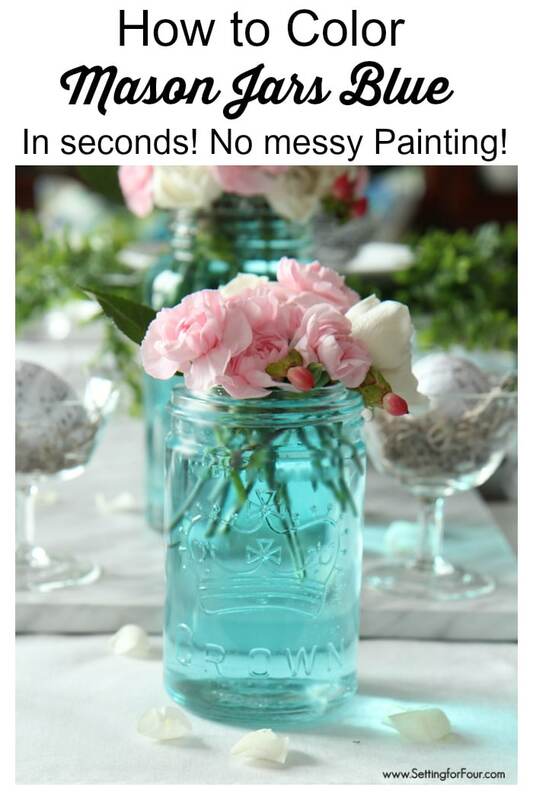 How to Tint Mason Jars Blue….so incredibly easy! Thanks Robin!! I do love my sparkle and shine!!! 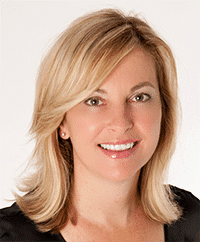 It looks so fabulous Heather! So pretty, fresh and spring-y! Love your little eggs & all the rest! 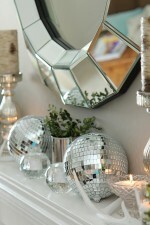 Your mantel is beautiful, love the mercury glass! Thanks Maryann!! A little sparkle and shine makes my world go around lol!! !